With the news that the Smithsonian has created the first-ever 3D presidential portrait, Intern Haley Rivero shares a close-up experience with another president's face. One day in behind-the-scenes collections storage, I stumbled upon the cast of President Abraham Lincoln's face. This object gave me chills down my spine. It was like looking directly at Lincoln. The plaster cast rests, face-up, in a drawer that's about waist high. When you pull the drawer out, there he is looking straight up at you! I couldn't think of anything more "Smithsonian" than looking at Lincoln's life mask. My internship project has been writing labels for protest posters for the American Democracy: A Great Leap of Faith exhibition. Beyond that project, I've helped with tasks in storage, by putting away and finding objects for various requests. Running around in storage has to be my favorite part of my internship, because you get to see (and sometimes carefully handle) amazing objects. On the day I stumbled upon Lincoln's face, I'd been searching for a knife box belonging to George Washington, which a visiting scholar had requested to see. While George Washington's knife box, a Revolutionary-era case with several small squares to put knives in, is a fascinating object that is deeply personal, it's Lincoln's mask that evokes a more intense reaction. The Lincoln mask in the Smithsonian's Political History collection is from 1860, made by sculptor Leonard W. Volk. Right before his nomination as candidate for President of the United States, Lincoln had this life mask made in Chicago. A bronze copy was made of this cast in 1886. When I opened up the accession file—a folder of paperwork explaining all there is to know about the donor and history of the object—I found all the measurements of Lincoln's face. Who knew his ears stuck out from his head at a 40° angle, or that the mole on his left cheek is ¾ inch from the corner of his mouth? 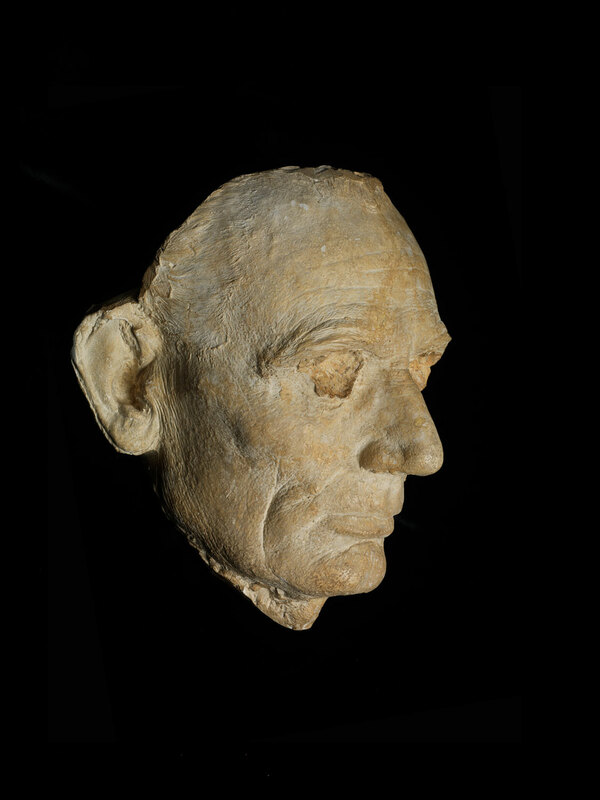 Life masks such as Lincoln's were extremely popular before the more prevalent use of photography. Death masks were also made—often for nobility, scholars, criminals, and artists, all the way back to early Egypt. Alfred Hitchcock, Leo Tolstoy, Benjamin Franklin, and Ludwig van Beethoven, to name a few, all have had masks made before or after death. It makes me wonder why famous men and women stopped having casts made. I understand that we live in a world with photography and 3D printing at the push of a button, but this is such a unique way to preserve one's likeness. It is truly incredible to look into these casts and see exactly how someone looked. Lincoln had another life mask made in 1865, and you can see the differences in his face. The Civil War played a major role in his aging. On the Smithsonian 3D site, you can check out a 3D image of the 1865 life mask! At the moment, you can also see this 1865 mask on display in our American Stories exhibition. Lincoln is believed to have suffered from multiple mucosal neuroma syndrome. The disorder causes face dissymmetry and bumpy complexion, as well as a tall and lanky stature—traits which Lincoln exhibited. Abraham Lincoln is often remembered for his top hat, his beard, and his height, but it has been fascinating to understand Lincoln on a much more intimate level. Being able to look him in the face is strangely familiar and also very powerful. I propose all presidents get a mask done; it seems like a great way for future generations to study and remember our leaders. It also gives artists and sculptors an opportunity to freeze someone in time forever. Being able to see so many important parts of history first-hand is truly a gift and an honor, and I will treasure this experience always. The first presidential portraits created from 3-D scan data are now on display in the Smithsonian Castle. This video shows how the portrait was made. Haley Rivero is an intern in the Political History Division at the National Museum of American History. She is a recent graduate of the University of Mississippi.